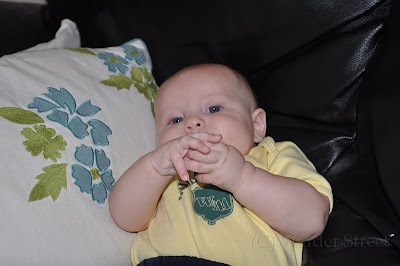 Baby William: New Pictures of William! Finally the computer is fixed (Thanks Taylor!) and there are new pictures of William on the site. 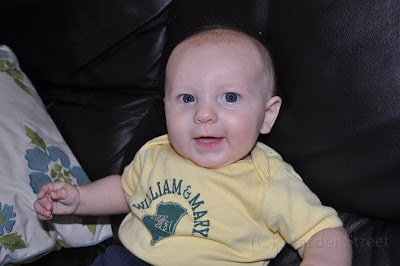 My personal favorites are of William wearing his William and Mary outfit. (Thanks Auntie Maggie and Auntie Clarissa!) He clearly wants to go to W&M. I think we'll have to plan a trip down there this winter to show him the campus. I mean, it's never to early to plan for college. William and I spent the weekend on the Cape and today in Boston. We were horrible about taking pictures but we had a great time. 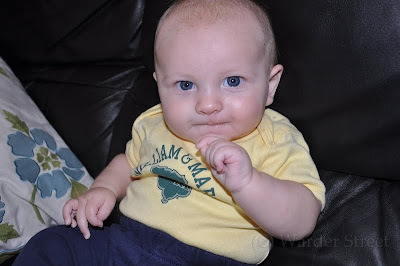 William loves visiting his Grandma Donna and Grandpa Mike! He also loves playing with Uncle Pat. As a special treat he also got to play with his cousin Kaylee. She is so beautiful and quite a talker! We fly home today and William can't wait to see his Daddy. In other news William has been declared completely healthy by the cardiology department at Children's National so we don't have to go back for any more EKGs. He weights 14lbs 11ozs. Such a big boy! I can't believe how fast he's growing. This week I finally took the infant insert out of his car seat. Next thing you know we'll be switching car seats all toghether!